This is an amazing cabin right on the banks of the Flathead river 20 minutes from Glacier National Park. This cabin is perched on a scenic bluff overlooking the majestic Flathead River. Every morning, rain or shine, walk out onto your covered deck on the Flathead river. Enjoy the sights, sounds and smells of nature in all her glory! Come home in the evening after a day in the park and have beverages watching the river sweetly flow by. The log-accented, fully-furnished cabins are cozy, comfortable, & secluded. A beautiful scenic home to come back to after a day in the park. Amenities include: Fully furnished kitchen, wood timber bar, washer/dryer,gas fireplace, river-view deck, gas barbecue grill, Satellite TV w/ DVD player. Convenient - Glacier National Park, Columbia Falls, Kalispell & Whitefish are all within a short, easy drive. Your Montana Dream Cabin is equipped with a worry-free gas fireplace providing warmth & ambiance on cool Montana nights. You’ll never want to leave! The modern kitchen is complete with refrigerator, stove, microwave, dishwasher, coffee maker, toaster and more! And, the natural wood cabinets are filled with pots, pans, dishes and utensils. Your favorite relaxation spot will surely be the river-view deck overlooking the pristine Flathead River. From here you’ll have perfect views of the natural wooded riparian areas & abundant wildlife. Deer, bald eagle, osprey, turkey, pheasant and partridge are frequent visitors. Imagine yourself stretched out on the deck in a comfortable lounge chair surrounded by the soothing sounds of nature, reliving the memories of a wonderful day of Montana adventure & excitement. At the end of the day you’ll fall asleep to the soothing sounds of Mother Nature’s birds, insects & flowing waters. A massage therapist is available by appointment. •	River-view deck provides scenic view of the majestic Flathead River. •	2 Bedrooms (Queen-sized bed in each) plus loft & full bathrooms - sleeps up to 6-8 adults. •	Fully furnished with kitchen, bar, washer/dryer and natural gas fireplace. •	Centrally located for easy access to all parts of the Flathead Valley & Glacier National Park. Our guests have told us they really enjoy Cabin on the River because... 1) it's proximity to Glacier National Park, Columbia Falls, Kalispell, Whitefish & Bigfork makes it very convenient. 2) it's located right on the bank of the Flathead River, offering solitude & scenery with views of Flathead River and Glacier National Park. And, 3) it's completely furnished making it a comfortable and economical lodging choice. Mountain views every where you look. The Flathead Valley is surrounded by mountains. On the beautiful Flathead River. Bring your own equipment and float straight to the property! River view deck is a guest favorite. Highly recommend this cozy spot for small groups that love adventuring. This is a beautiful quiet spot with easy access to surrounding communities, fishing and hiking. Our son and his girlfriend were attending a conservation conference in Whitefish, and we chose to make this headquarters for a family get together. Visiting late in the season left no shortage of activities. The cabin was well appointed for meal prep, and sitting outside enjoying the Montana fall. The fish were biting in the Flathead (thanks to some pointers from Lary’s Fly Shop), and the leaf change was spectacular. The place is a quick ride from the airport, easy to access, and relaxing beyond description. We didn’t scratch the surface of things to do locally, but we will come back and keep chipping away at it! Very nice, clean and comfortable cabin. Kirk and Deb were really easy to work with. Can't wait to come back again!! My husband and I, with our son, brought my parents to this cabin the first week of August. I absolutely loved the location, which was central from everything. The cabin was very clean and comfortable. I would have liked it better if the trails leading to the river were more senior friendly for my parents. They were not able to go down the steep slopes to the river. All in all I truely would recommend this experience to anyone. We enjoyed the quiet scenery and I would definitely go back to stay again. Very nice stay with plenty of room! We stayed in the Middlefork cabin and it was the perfect size for our family of 8. Very nice and cozy and gave you the feel of Montana living. Our stay at Middlefork Cabin (June 2018) located at Gentry River Ranch was absolutely perfect. The cabin was exceptionally clean, well maintained, decorated to perfection, and oh-so-comfortable in every way. Cool, fresh Montana air billowing in the windows at night made for an amazing night's sleep in the comfy beds. Plenty of room for our party of 8 to hang out and relax watching T.V., playing cards, reading, cooking meals, etc. We were able to keep up with our laundry since the cabin has a brand new Electrolux stackable washer and dryer. Also, we enjoyed spending time on the lovely back porch deck grilling burgers and steaks on the nice gas grill provided. Even though the beautiful river flowing behind the cabin is somewhat hidden due to a lot of surrounding natural vegetation, it is still a gorgeous setting. We absolutely loved it. This cabin had everything we needed and were looking for to accommodate our first ever Montana vacation. We would most definitely stay here again in the future. The location is ideal for visiting Glacier and activities around the area. There were eight if us in the Middle Fork cabin. We very much enjoyed the setting, especially the outdoor deck. The cabin is in a pretty setting. I would recommend the owners do some miner upgrading. There are not sufficient dishes in the condo and it would be nice if the owner fixed up the trails to the river and mowed some of the vegetation to improve the view. If you plan to work remotely, know that wifi in this area does not work consistently. Your rental cabin is on Gentry Way (at the West end of Lewis Lane/Badrock Drive), just South of Columbia Falls, located in Northwest Montana’s Flathead Valley. Once on Lewis Lane, continue past the 'Dead End' sign. The “Flathead,” as locals call the valley, lies just west of the Continental Divide in northwest Montana. 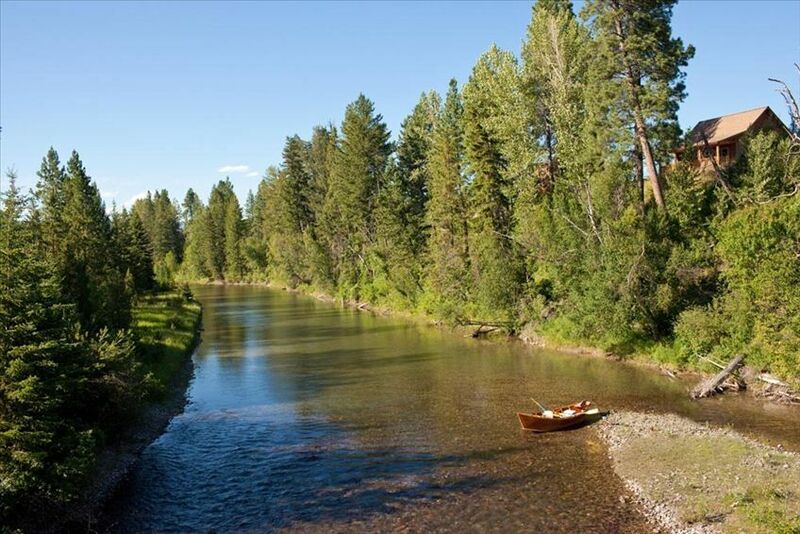 Gentry River Ranch is a short distance away from Glacier National Park, designated hiking areas, 2 ski resorts, 9 golf courses, Flathead Lake, and Hungry Horse Reservoir. With the abundance of recreational opportunities and aesthetic values, it's not hard to see why the Flathead Valley is among the most popular areas in Montana. Come visit and you’ll see why many visitors return here year after year. A surprisingly mild climate invites you outside all year.